Day 107: Infantry Graduation Day! After the Turning Blue Ceremony on Thursday, April 28, it was time for Graduation Day for the United States Army 198th Infantry Brigade on Friday, April 29. 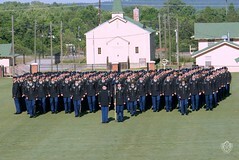 This was an amazing graduation ceremony with lots of people held on the Soldier’s Field behind the National Infantry Museum. Ben was part of Delta Company 2nd Battalion 19th Regiment. This is a picture of his company all lined up on the field. In Ben’s Company there were a total of 214 men. However, this is just a small glimpse of the actual size of the graduating class. In all a total of 614 men graduation from five different Battalions making up the entire brigade of graduates. a good seat. As you can see General Sarge was quite interested in the various insignia’s of the different Battalion’s represented in the graduation. But, it didn’t take him long to find the one for Delta Company! Here he is pointing, or should I say “paw-ting” at the insignia of his human-owners company. Once again this was a very proud day for us. We had no idea there would be so many men – turned Infantry soldiers graduating with Ben on this day. Believe it or not, but even with 614 men graduating, the ceremony was only about an hour. The big day is actually the Turning Blue Ceremony when everyone takes the time to put on the blue cord. 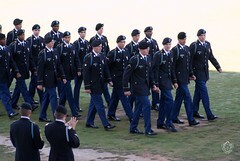 Graduation day is more about seeing all the soldiers lined up and parading onto Soldiers Field. Watching them all move in step is fascinating. Left, right, left, right, left, right! If you look real close in this picture, you can pick PVT Benjamin Jeffrey third in line on the outside row. They’re all dressed the same and they all pretty much look the same. But when he’s your son, even in the see of faces, you can pick him out of the crowd. It’s also worth pointing out that at this point of the graduation the soldiers are actually marching on “sacred soil”. When an Infantryman graduates and marches across the field, he is walking on soil fought for by many who went before him. The National Infantry Foundation gathered jars of soil from battlefields all over the world and then spread that soil on the field. Marching right before our eyes is a piece of history, marching on history. More Pictures From Graduation Day – Click Here! So, now we’ve covered the Turning Blue Ceremony and Graduation Day. Tomorrow it will be all about General Sarge as he found a wonderful surprise inside the National Infantry Museum. This entry was posted in 2011 General Sarge Posts and tagged Army, Build-A-Bear, Fort Benning, General Sarge, Infantry, Military. Bookmark the permalink. 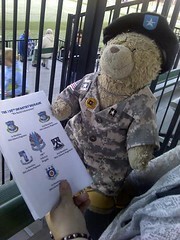 I have to tell you, General Sarge was very excited the entire time we were at Fort Benning. Sometimes he almost jumped right out of our laps when he saw his human-owner PVT Ben. It had been a long time since he’d seen him. Congratulations to Ben and members of Delta Company 2nd Battalion 19th Regiment for reaching their training goal, graduation. I bet your heart swelled with pride as Ben marched, in unison, with this entire company across sacred soil. Speaking of sacred soil, I did not know that fact about how it became sacred, thank you for sharing that detail. Best wishes to Ben in his future endeavors and I hope that his next phase with the military is a successful as his basic training. It was a very moving ceremony. Seeing all those men out there was incredible. As for the “sacred” soil, that’s amazing too isn’t it. If you’re ever in the area of the Museum it is worth the visit. How’s D.S. Buff doing? I know she’s working hard behind the scenes to help us with the Bear Dare here! As for my human-owner Ben and his future endeavors, I’m trying to figure out if I can “stow-away” in his duffel bag and go to FT Lewis with him. But, I have a feeling if I did that his human-owners Dad would miss him even more. So I know I’ll be brushing some “bear-tears” away with my paws but I’m also ready to encourage Dr. Rus and all the other military families that need encouraging too.